My Flooring America offers unmatched flooring and carpeting from top-notch companies in Flower Mound. We uphold superior services by offering outstanding flooring, low prices and expertise you can depend on. Locally owned, My Flooring America is dedicated to installing the right type of flooring for your home. Our specialists will provide an enjoyable experience every step of the way! Upgrade the look of your home with a new set of vinyl flooring in Flower Mound, TX. At our showroom, we give homeowners a way to create a fresh atmosphere throughout every room. With our selection of vinyl floor products, we have everything you need to make your space stand out for all of the right reasons. Whether you want to enhance your bedroom, entryway, or living room, you are sure to find something you love when you shop at our local flooring store. Our collection includes countless styles from some of the leading brands in the industry. Visit us today to schedule an installation in any part of your home. Choose resilient flooring from our collections for any area or room in your home. Over time, even top flooring products will start to show signs of wear and tear. If your household has children or pets, it is helpful to select a durable floor that will stand up to regular use. Vinyl is a sturdy material that offers stunning looks and enhanced durability against cracks and other issues. Because it is a strong option, it is an ideal material for use in any room. Vinyl floors are a popular flooring option because of its resilience. It stands up to high impact and is great for busy households. Amongst all types of floors, vinyl flooring creates the softest surface. 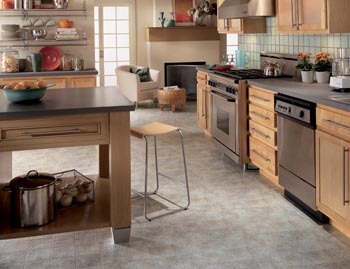 A vinyl floor is perfect for kitchens, bathrooms and areas with a lot of activity. Vinyl flooring options include no-wax, urethane and enhanced urethane. Each type offers various advantages. Enhanced urethane stands up to scratches, grime and cleaning solvents. When you are ready for a style update throughout your home, a new set of flooring can create the atmosphere you want at a price you can afford. By choosing resilient flooring for your space, you will upgrade the look of any room while also creating a durable setup. Our flooring products are made from top quality materials that are designed to last through heavy use without damage. Whether you prefer a classic or modern style, our showroom features vinyl flooring in a range of designs and colors. When you visit us, our sales team is happy to speak with you about each of your options with you. No matter what your preferences are, we work hard to bring your design ideas to life for a competitive price. Ensure that your installation is completed the right way when you work with our team of contractors. Our experienced staff members understand how to perform a full vinyl floor installation in rooms of all sizes. By focusing on the details, we are able to ensure that every tile is placed properly. Whether you choose vinyl tile or plank, we work hard to deliver the top results for your new flooring project. My Flooring America’s professionals assist with your flooring specifications from the initial consultation. During an appointment, we will listen to your expectations and offer excellent suggestions. We will choose premier flooring options based on the qualities that are most important to your home, such as your budget, water and moisture resistance, low maintenance and style preferences. After the project is complete, our friendly consultants can provide great floor-care tips. Correctly maintaining your floor helps prolong its life and keeps it in great condition. Contact us to learn more about our selection of vinyl flooring. Our vinyl floor products are available throughout Flower Mound, Texas.